Successfully Added DivX Player USB HDD Enclosure With Display to your Shopping Cart. Cool-Looking 3.5-inch IDE HDD External Enclosure that plays multimedia files including DivX videos. Fan cooled HDD enclosure. Mains DC powered, power adapter supplied according to your country's format. Supported under Windows ME / XP / 98, Mac OS-9/X, Maybe Linux but not tested! Login for wholesale discount prices. No MOQ. on 2007-12-07 17:07:45 WinXP CAN FORMAT! Just for all of the people formatting to FAT32, there is a GUI based format utility in Windows XP. There is a full GUI, just right click on a drive/partition/volume and choose what you want to format. I bought this enclosure as an experiment, to see how convenient copying media to a large-capacity media box like this would be. The previous comment by "Fred" asks why people would consider copying DVDs to a media box? Simple - nowadays, most DVDs are downloaded from the Internet and are usually stored on a hard disk before they're burned to DVD. Rather than going through the process of burning DVDs in order to play them on a TV set, this media box is what most downloaders are looking for - a solution where they can download, play, and then throw away movies without wasting money on blank media. Few other things I want to mention... First, it is true that you SHOULD format your drive as FAT32. Unfortunately, Windows XP does not allow you to do this within the GUI. You can, however, format a NTFS drive as FAT32 within the command prompt, using the DOS FORMAT command (use FORMAT /? for help.) Once formatted as FAT32, the box will play VIDEO_TS folders just as smooth as a DVD. One thing I have to complain about the box is that it isn't properly shielded. I sent this media box on top of a Panasonic DVR. With the media box on and the Panny recording, the video on the Panny is heavily distorted. Turning the media box off corrects the video, and turning it back on once again distorts the video. I have to keep the media player a minimum 2 feet away from the Panny. I'm using Monster cables, too, so it isn't the cables that is giving off the interference. If you look at the inside of this box, it is basically all plastic with very little shielding, if any. So before you use this media box near any other video equipment, experiment with the media box turned on. One other problem regarding subtitles... It seems that only DivX/XviD files are supported. I tried using both SRT and SSA files along with a MPEG-2 file (extension .MPG), and it didn't work. So the only way I can see using subtitles with MPEG-2 video is to actually master a VIDEO_TS build and embed the subs into the project. I believe the review submitted on the 12/22/2006 by Adam is somewhat harsh, the problems that he covers regarding the VOB files playing jerky is due to the drive being formatted as NTFS. This problem is eliminated if the drive is formatted as Fat32 say outside windows using say the Seagates utility of Disk Wizard "starter edition". The manufactures specification should be amended to state that the NTFS system is partly supported as far as VOB files and certain MPEG files. I must admit that it would have been easier if the drive was formatted within Windows as NTFS since Fat 32 is only supported for partitioning drives up to 32 Gig, then again its not such a big deal since you only format the drive once. Hence you are forced to format the drive as Fat 32 outside windows if any larger than 32 Gig. I fail to see why anyone would want to transfer their DVD collection to a Media Box, let alone the effort of copying or transferring the files to ISO images just so you can play it on the Media Box. 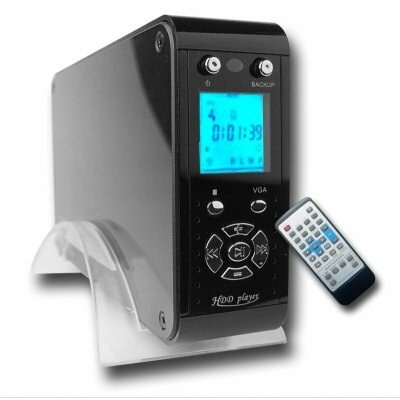 All Mp3 audio files & Jpg image files, Home movies Mpg1 or Mpg2 or Divx files played flawlessly. Admittedely it would have been nice to have the facility of a playlist for those files, the only alternative around this is to place the files by moving them to a separate folder which would constitute your playlist. One must remember that everything you wish for is price related and at 100 Australian dollars I would rate it at 3.5 Stars. Where this media box really shines, is that if you had a digital TV tuner card in your PC and with the free to air stations now transmitting in reasonably high quality, the bitrate of the recordings is significantly higher than DVD, thus making the task of burning your MPEG 2 movies to DVD quite painful, primarily because they won't fit on one DVD, so the option is to transcode it (say) using Nero to a lower bitrate or compress the file to DIVx, or burning it to a Dual Layer DVD all of which is quite time consuming, however using the Media Box, you would simply copy your MPEG 2 file to your drive and play it on your LCD or Plasma screen flawlessly. Finally there are 2 models on offer, the model that Adam bought and another model that has RCA connections at the rear of the box 5 RCA's for the RGB (Red Blue Green) and a (vertical) & (horizontal) Sync, which makes up the VGA via an adapter which is included as part of the accessories (not to be confused with component out) which this model doesn't have. In addition it also has 2 RCA out for Audio, as well as a Composite out RCA as well as SVideo out, so examine the rear of the box and it should have a total of 8 RCA out and an S video out, and this is the model that I recommend. Well, it can play DivX films, but don't hold your breath with it's DVD features. VOB files play back with jerky audio and sound, DVD menus are not supported, neither are DVD subtitles or chapters. The LCD screen only displayes mode and time into media. Not your media choice, so I don't recommend this replacing your Hi-Fi. Also as it has no RANDOM/SHUFFLE function so any MP3 you listen to will be the same, in the same order, time and time again. Likewise with the photos it has no shuffle function on the slideshow. It does have a repeat folder option though. Fittting the drive is ok, but by no means quick, as it uses the normal method of 4 screws, although 2 of the screw holes where obscured by wires. When taking it apart it was obvious why the STOP button (A crazy button which seems to do the same as reset) didn't work as the button wouldn't make contact with the switch. Menus are easy and obvious, but a hard disk full of media results in a long SEARCHING time when selecting a PHOTO,VIDEO or MUSIC option. The VGA output (main reason I bought it) doesn't have any audio out! RUBBISH, watching DVDs on a lone monitor with speakers is not an option, unless you don't like sound. The drive working as a USB extrernal harddisk is poor. It has a random 3 ended usb lead and would drop out of recoginition from the PC regularly after copying a folder. I have yet to try its backup function. If the price was any more it would definiley be a 1 star. I should have waited a few months and bought a TVisto.